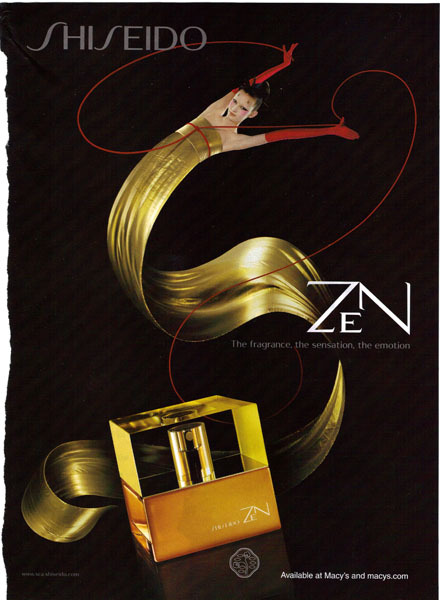 This is an ad for Zen, a perfume, and came from a fashion magazine. The fragrance, the sensation, the emotion. To begin with, I have to say that this ad is very pretty. The colors are great and it really pops. I’m a little put off by the model. She looks very Caucasian-made-up-to-look-Asian to me, which always feels creepy and wrong. It’s like blackface, you just can’t do it without it being offensive, no matter how you mean it. Now, maybe she’s Asian and they made her up to look really white, but then I’d have to ask why? This ad is all about the Asian influences and themes, so why make her look more white? Looking beyond the model and the visuals, I’m not sure what to make of the text. I really wasn’t aware that “zen” was an emotion. What kind of emotion? What does it feel like? How would you describe it or illustrate it? I’m not sure it’s a sensation either, but I can buy that one just a little bit more. My dictionary defines “zen” as “enlightenment, attained through meditation, self-contemplation and intuition rather than through the scriptures, from Zen Buddhism”, which isn’t a sensation, but is closer to one than to an emotion. Regardless, this leaves me wondering what this perfume smells like. How do you bottle the smell of enlightenment? Or do you just ignore that part and bottle generic Asian smells and steal a religious word for it’s name? Because that’s kind of offensive. What if someone was selling a perfume called something like “Baptism” or “Crucification”? Because it seems like that wouldn’t go over well. edit: It was pointed out to me in the comments that my definition for “zen” isn’t great. I knew that it wasn’t the best definition, but the intention was more to point out what zen was not than what zen was. Translating a word like that is a bit tricky, from what I understand. But the point is well taken. “Zen” refers more to the process of searching for enlightenment than the end result of actually having achieved it. I still believe that my comments about it not being an emotion or, really, a scent that can be easily bottled stand, and so I’m not going to actually redo the post. But I do think that it was a fair criticism of my commentary. Thank you for the clarification. This entry was posted on February 3, 2010 at 12:00 pm	and is filed under Beauty. Tagged: perfume, print-ad, shisheido, zen. You can follow any responses to this entry through the RSS 2.0 feed. You can leave a response, or trackback from your own site. Zen does not mean enlightenment, it really means “meditation.” It refers to the process of realizing one’s true nature through meditation. This could be considered enlightenment but it isn’t a word that should be equated with Zen. Zen is a very overused and abused word meant to evoke images of chicness and simplicity. Chinese, Ch’an. Buddhism. a Mahayana movement, introduced into China in the 6th century a.d. and into Japan in the 12th century, that emphasizes enlightenment for the student by the most direct possible means, accepting formal studies and observances only when they form part of such means. Compare koan, mondo. 2.	the discipline and practice of this sect. I agree that the word is incredibly overused. That’s part of what I was objecting to here. I disagree that I got the definition wrong, though. My definition may have started with the word “enlightenment”, but it clearly focused on and required the process. If you’re going to quibble with the definition from my dictionary (and, incidentally, the religion textbook next to my desk gives an incredibly similar definition), I would say that the one you gave from dictionary.com isn’t any better. They are basically the same in the particulars. I would also point out that a dictionary probably isn’t the best place to find out about a spiritual concept (nor is a perfume ad). I appreciate the attempt at clarification, but I’m not sure it worked as well as you’d like. Nevertheless, I’ve added a postscript to the end of the post attempting to address your concern. I really do appreciate your comment and will attempt to be more careful with things like definitions in the future. The model in the ad reminds me a lot of the makeup and dress in several of the Circ du Solei shows, especially Ka. I think that style (at least in the Circ shows) is meant to be abstract with Asian inspiration (like taking from court makeup and painting styles) rather than trying to ape a particular race. The flow of her clothing and the red cords makes me think of Circ du Solei as well.